When I heard the ER-6nL was getting replaced with the Z650L for MY17 my mind began to wander… A ZX-6R-based in-line four-cylinder streetfighter with four-into-two-into-four pipes sweeping up each side of the swingarm; stiff suspension; and style: upswept seat with the ‘Z’ pattern styling. It would kick arse! So part of me was a little disappointed inside when I hear the Z650L will be based off its Learner-Approved parralel-twin Ninja, with a two-into-one exhaust, basic suspension, and no ‘Z’ on the seat… ‘How dare they destroy the sanctity of Z,’ I thought to myself. I love the ‘Z’ seat! 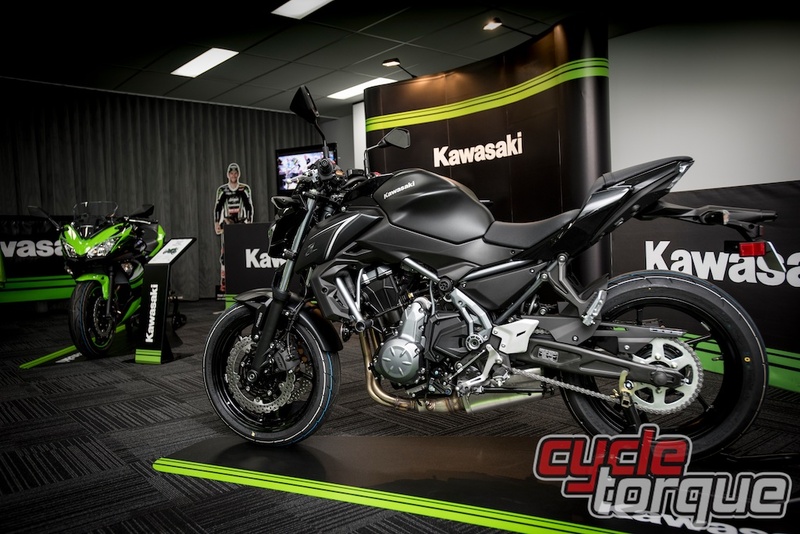 I struggled with these thoughts all the way up until I saw one in the flesh for the first time, at Kawasaki Motor Australia’s press launch for the Z650L and Ninja 650L. There it was, laid bare in front of me, all-black with white accents. It looks good. Real good. Expectation is such a silly thing when you take a moment think about it. It was at that moment I came back to reality. The zed in my head would make no sense in today’s market: too expensive and uncompromising, with its power too high in the rev range. But the zed before me does: it’s affordable and easy to own, being aimed squarely at learners: newcomers and returners alike. The Z650L is also a major departure from the ER-6nL it replaces. The looks and style have been updated. Gone is the offset rear shock and twin spar frame. I really like the ‘Z’ LED tail light. 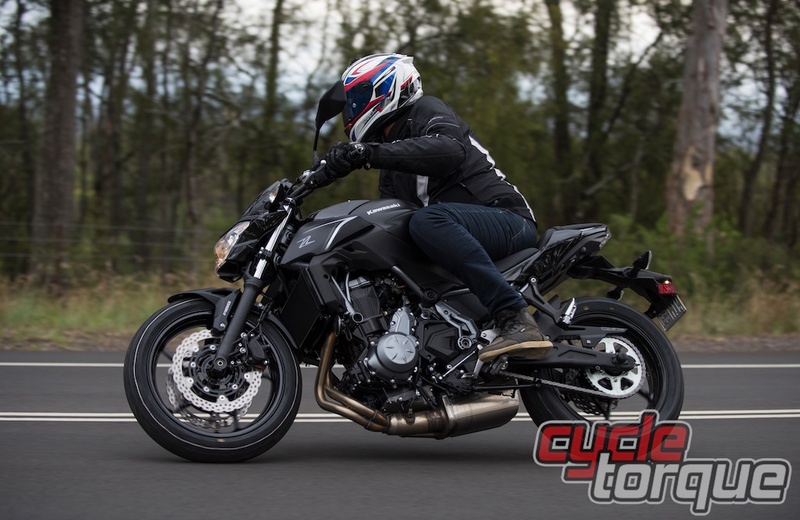 The engine remains largely the same – in capacity, bore, stroke and gear ratios, with the Z650L producing slightly less power, but slightly more torque. The airbox, throttle bodies, injectors, intake and exhaust cams, intake ports are all new and have been added to increase low-to-mid response, while Kawasaki has added a slip and assist clutch. A new trellis frame has also been used and accounts for a lot of weight saving: all up the new Z650L weights 14kg less than the ER6nL it replaces. Kawasaki’s main focus for its 650-twins remains towards making it practical for learners and everyday riders in everyday riding situations. It starts with the quick-revving engine tuned for low- to mid-range torque; continuing through the lightweight trellis frame and swingarm, to the low seat height and wide, flat handlebars, plush suspension and neutral-positioned footpegs; culminating with a slip and assist clutch, adjustable levers, comprehensive instruments which feature a gear-position indicator and shift light amongst other fuel and distance read-outs, and most importantly: ABS brakes. On paper Kawasaki has made a bike which everybody is able to use, inspiring confidence in fresh-faced or returner riders the machine is aimed, whilst also making it very user-friendly for commuters. 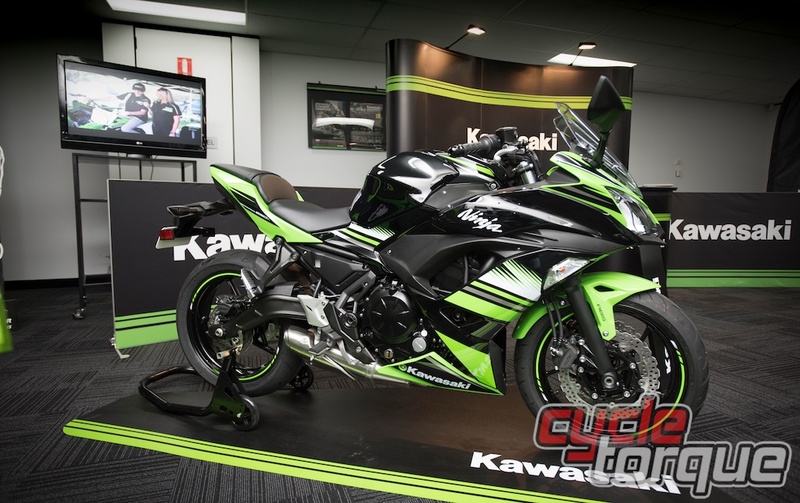 My last experience with a Kawasaki Ninja was at Sydney Motorsport Park, onboard the super popular Ninja 300. I took one out in standard trim against mid-teens on their one-make series Ninja 300 Cup bikes. The whippets pantsed me around the short circuit on their all but beefed-up machines. I had a ball, unable to believe the capability of the bike, let alone ones with track-based modifications. My eyes had been opened. KRT Replica: Shut up and take my money! I have also ridden the previous generation Ninja 650L before I started working for Motorcycle Publishing full time. I sat in someone’s blindspot for a fraction of a second too long on my way to work one morning and got clipped after they changed lanes without checking their blindspot beforehand. Miraculously I stayed on the bike, both it and myself were left completely unscathed. Lesson learnt: if you are in a blind spot, move out of it… Some physics beyond my pay grade obviously played its part too, but I put it down to the riding position of the Ninja, which allowed me to stay in control as I veered off-course towards a convoy of parked cars. My confidence in the bike’s ability to keep me on the road has been pretty high since that day. For 2017, the 650 Ninja is for the most part a new bike. As I mentioned earlier the biggest change for Kawasaki was doing away with the twin spar frame, opting for a trellis frame which weighs something like 10kg less than the old one. All up the Ninja weighs 19kg less than the 2016 model. Being a Ninja, it has a full fairing, which means the cockpit is mounted further forward in the windscreen instead of the ‘bars. This also means a need for different ‘bars compared to the Z650L too. Other than that, everything else is practically the same on both bikes. As I said before the engine update makes slightly less power, but more torque optimised in the low- to -mid ranges, which maxes out a bit higher at 6,500rpm. 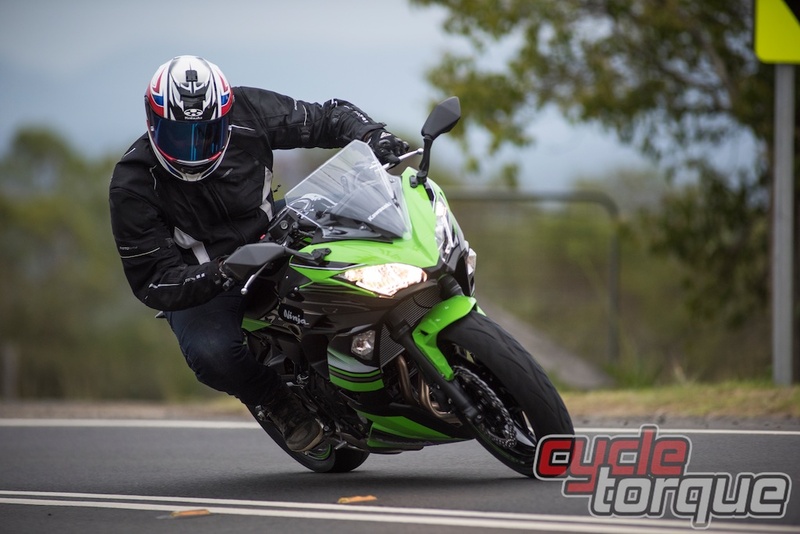 It is interesting to note here that Kawasaki will bring out a full power Ninja 650, which makes maximum torque at lower revs than the MY16 Ninja. From what I could gather at the launch, the learner model is definitely restricted at the throttle body. Judging by the Ninjas 650Ls of years’ past, there is more than likely a removable plug which restricts the ECU too. Kawasaki currently doesn’t expect to bring out the full-powered Z650 to Australia, but readers with common tools can leave it up to their own devices over what they can do to get the most out of both bikes. I set off from Kawasaki HQ on the Z650L and the first thing I notice is the slip and assist clutch and engine response. The bike gets away from a stop with ease, building speed through the low- to mid-range just as it said on the box. The suspension is set on the softer side and soaks up the uneven surfaces and concrete to tarmac changes well. The riding position feels pretty good too. the ‘bars slightly forward of upright, ‘pegs lying directly underneath the seat. We ride through Sydney traffic for around an hour or so, heading West to the Hawkesbury Region: through Pitt Town towards Wisemans Ferry. The engine’s strong performance in this real-world setting is clear. It doesn’t need to be kept on the boil, instead it’s happier toiling- pulling along nicely in each gear. Speed limits up to 80km/h can be reached under 5,000 revs. The bike stops well too, two big 300mm rotors hugged by two-piston calipers mounted regularly up front are intuitive and confidence inspiring in traffic. As we approach some faster bends I notice some slight vibrations through the ‘pegs and seat between 5,500 and 6500 rpm. The slip and assist clutch makes it feel impossible to stuff up down-shifts. Up-shifts without using the clutch feel smooth. The bike is geared short: accelerating in top gear from low speeds is achievable, though it will have a tendency to sign off earlier in the rev range. 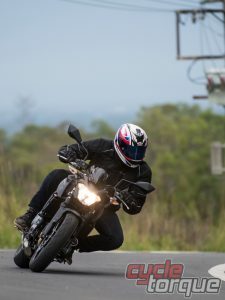 Not that this really matters – the Z650L is good for speeds well beyond the highway limit. In a few emergency braking exercises it takes some serious stopping before ABS engages. I am really impressed with the ABS unit. The seat is fairly plush, but a bit over an hour into the ride I notice the contour is starting to cause a bit of discomfort. We do a few passes to get some photos done and it starts to rain. Pearl Flat Stardust White looks good too! Compared to the Z650L, I found the Ninja to be slightly more comfortable. The ‘bars are a faux-styled clip-ons which mount to the top clamp instead of the forks but they in fact sit a touch higher than the Z650L’s ‘bars. It perches the rider more upright which in turn affects the knee angle which I found pretty good..
There’s a bit more wind protection too, but besides that, both bikes ride equally as good and are both extremely confidence inspiring. If you are a taller rider like I am or spend a bit more time commuting at freeway speeds the Ninja 650L would be the pick in my opinion. The slightly more-upright riding position and extra wind protection is enough to sway my money. If you are of normal stature, I reckon it comes down to picking the style you like most. Anyway, colour preference is a subjective thing. Get into your local Kawasaki dealer and check them out in the flesh for yourself! 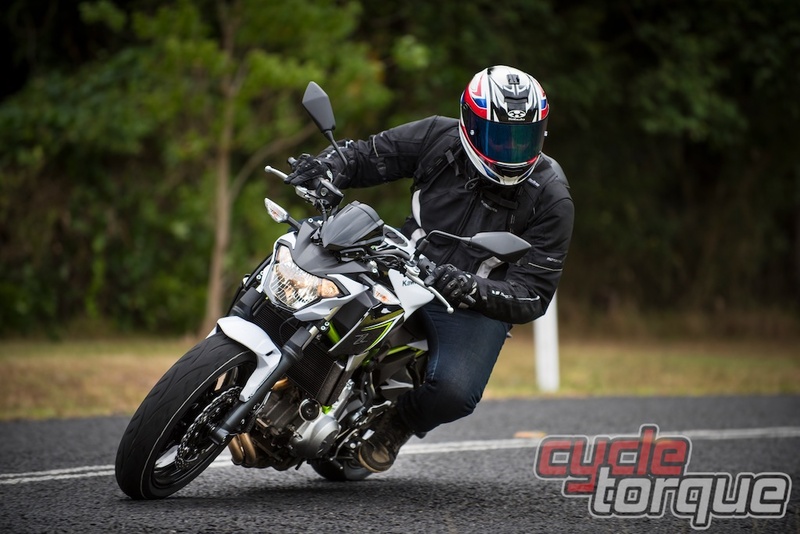 Despite my grandiose expectations, there are no surprises with either the Ninja 650L or Z650L in the real world. Kawasaki has done a great job with both bikes, creating great packages for learner/returner/commuter market. Most people would be able to jump on either bike straight away after doing their two-day pre-learner practical. Anyone graduating to their Ps from a smaller machine will revel in the bikes’ usability. The list of practical rider-friendly features is as good as it is long, inspiring so much confidence and offers strong, reliable performance for their their respective category.